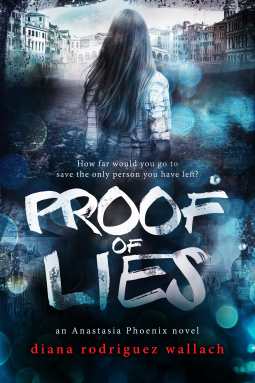 Diana Rodriguez Wallach's Proof of Lies follows young Anastasia Phoenix as she steps into a world of espionage and secrecy while fighting to get her sister back. Anastasia and Keira have already dealt with the blow of losing their parents in a fiery car crash. When Anastasia discovers signs of her sister's possible demise, she sinks into a depression so deep only the barest scrap of evidence that Keira's alive can pull her out of it. Along with their best friend, Charlotte, and a new transfer student, Anastasia uncovers a shocking conspiracy. Proof of Lies is very similar to AnnaLisa Grant's Oxblood, but with a more complex storyline that ties into a larger plot. Where Victoria Asher becomes whatever she needs to become to save her brother, Anastasia Phoenix would rather beat down walls to get answers. In other words, Anastasia is a blunt force that dives head first into a situation that could end in her death. Someone with no experience, no resources or knowledge of the secretive world she has stumbled upon, can't just demand answers. Otherwise, the dialogue sounds like someone asking a lot of questions that won't be answered. The story moves at a decent pace that allows you to absorb the facts that are revealed throughout the story. There isn't a lot of action in the traditional sense, but the tone of the story is just the same. There's an adrenaline rush that comes from wanting to find out what happened to Keira and discovering what's at the end of Anastasia's journey. Compared to the time it took to get to the climax, the ending seemed a little rushed. On the other hand, it could be that the revelations at the end of the story will be more focused on in the next installment. Either way I'm definitely willing to see where Lies That Bind takes us. There are more secrets to unfold and plot twists to explore!